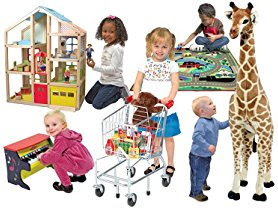 Hurry over because today only these Melissa & Doug Favorites start at $13.99 (Reg. $24.99+) at Woot.com! Shipping is FREE for Amazon Prime Members or only $5 flat rate. I love the Melissa &amp; Doug 2462 Hi-Rise Dollhouse now just $79.99 (Reg. $149.99)! Fresh, gender-neutral colors against a natural-wood frame make this modern dollhouse an appealing option for both girls and boys. Modern touches such as a garage with lift-up door and an elevator in the center avoid the formality of some more traditional dollhouses, making it a great option for today's kids, while maintaining a clean look and timeless appeal that will fit in with existing decor in just about any setting. The open sides also make this play set easy to share: Multiple children can reach in from the front, sides and top. It's perfect for preschools or families with multiple children and great for play dates too. Open Floor Plan - Open sides make it easy to access every room with ease! Decor &amp; More - Comes with 14 pieces of furniture and three play people! Going Up? - Ride in the elevator, located in center of home! Drive Right In - Pull into the garage with its lift-up door!